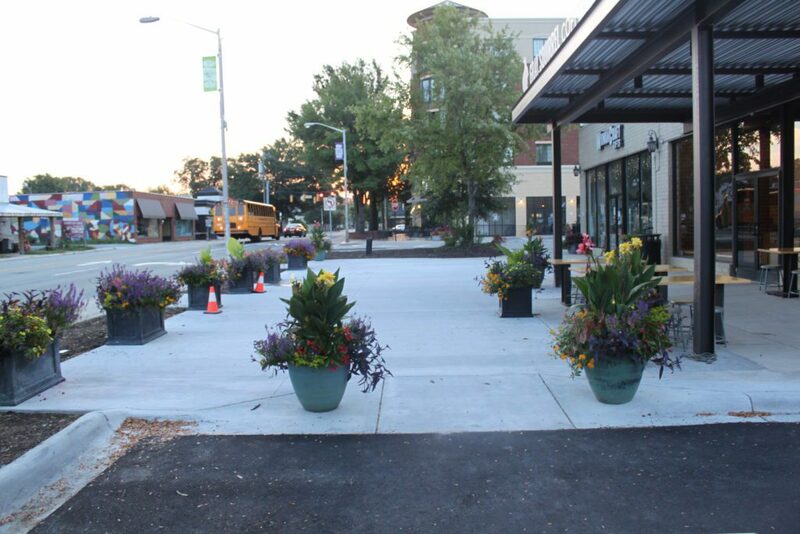 Commercial Concrete Services - Paving Professionals, Inc.
Our company also specializes in offering concrete services for commercial properties. Among the services provided are heavy duty concrete pavement parking, concrete curbs and gutters, concrete monolithic pours, concrete patios, concrete dumpster pad installations and repairs, concrete ADA compliant handicap ramps and any other major concrete commercial applications. We believe that offering concrete services in addition to our asphalt division is a win for our customers due to the flexibility and options provided to meet your demands. Some customers prefer concrete while others prefer asphalt for its flexible pavement, but we’ve got you covered, in either case. Concrete parking curbs are commonly used in retail businesses, schools, churches and public parking lots to protect signage, utility poles, shopping carts, garbage receptacles and other parked vehicles. 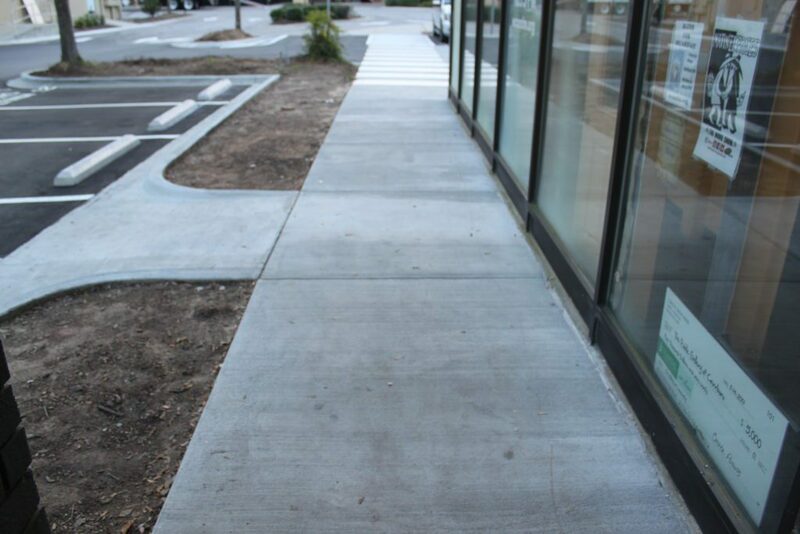 The concrete parking curbs are also used to line sidewalks to protect pedestrians from vehicular traffic. 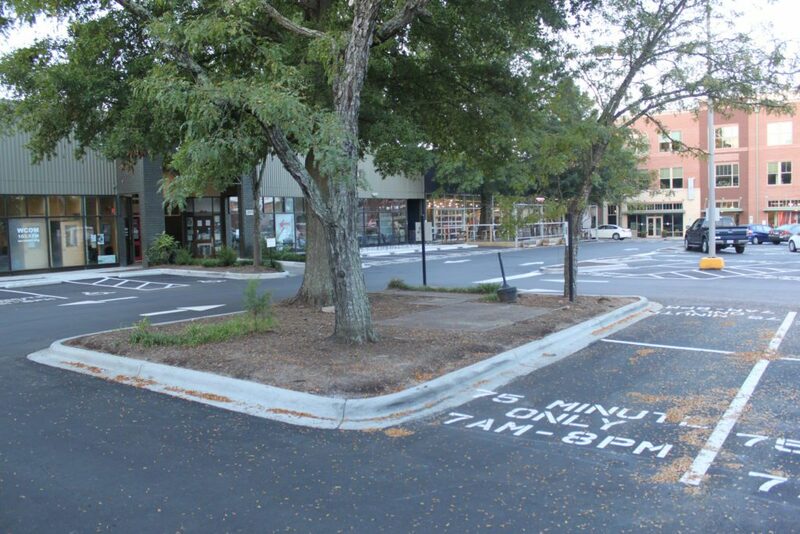 The neat, straight lines of curbs add to the attractiveness of parking lots and streets, and the commonly used expression “curb appeal” implies that attractiveness of adjacent properties is also enhanced by sharp demarcations between streets and lawns. Curbs reduce the amount of space or right-of-way required for a street by eliminating drainage swales and their flat side slopes. There are several types of curbing as well as different sizes. 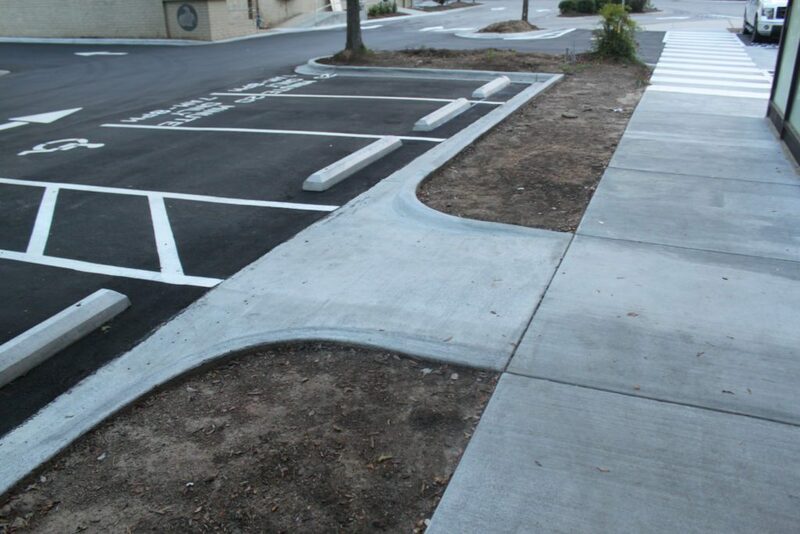 At Paving Professionals we can install all the different types of curbing. Sidewalk repair services not only make a sidewalk safer to people, but sidewalk repair can enhance the curb appeal of a property or neighborhood. Dumpster pads can be made of different materials yet the optimal material is concrete. Consider the incredible amount of downward force that trash trucks and metal dumpsters place on the pavement. Concrete is quite the sturdy material so it will not cause dents, dimples or make any other sort of impact in the surface like asphalt. The result is a preservation of the concretes integrity rather than the premature failure created by other materials, especially asphalt. When a metal rebar or wire mesh is put into the slab, a remarkably strong steel and concrete combination results. This combination can withstand the rigors of excessive force for much longer than asphalt when impacted by a trash truck’s enormous load. Ideally, the dumpster pad will stretch out about 10 to 15 feet ahead of the dumpster. This positioning allows the front wheels of the trash truck to rest on the pad and absorb the truck’s massive weight. It is important to note that trash trucks commonly leak because of the strain placed on the built-in hydraulic system. Thankfully, concrete cannot be negatively impacted by oil that leaks out of these trucks and other vehicles. Such an oil leak or the leaking of the trash truck’s hydraulic fluid will weaken asphalt yet it will not affect the integrity of the concrete slab. 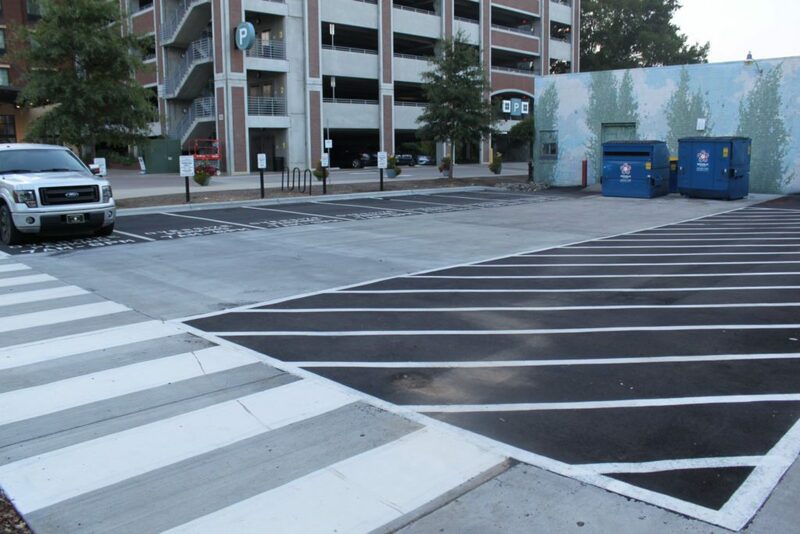 If your building needs an ADA compliant parking lot ramp installed, look no further than Paving Professionals, Inc. One of our specialties is the installation of these specialized ramps. Most businesses, churches, schools and other organizations must follow ADA ramp specifications and ADA requirements for handicapped wheelchair ramp access. ADA Ramp Specifications Require a 1:12 ramp slope ratio which equals 4.8 degrees slope or one foot of wheelchair ramp for each inch of rise. For instance, a 30 inch rise requires a 30 foot handicap wheelchair ramp to be compliant with handicap accessibility laws. ADA Guidelines Require a Minimum 5′ x 5′ Flat, unobstructed area at the top and bottom of the ramp for wheelchairs. ADA Standards require permanent and removable wheelchair ramps to have a minimum width of 36 inches of clear space across the wheelchair ramp. Massachusetts and California ADA code now require 48 inches ramp width to be an ADA compliant ramp. ADA Code Compliance Require a Minimum Turn Platform size of 5′ x 5′. California ADA ramp code now requires a minimum 6 foot (in the direction of travel) platform size. ADA Guidelines for Wheelchair Ramps allow a Maximum run of 30 feet of wheelchair ramp before a rest or turn platform. ADA Ramp Guidelines Require ADA Ramp handrails that are between 34″ and 38″ in height on both sides of the wheelchair ramps. Our commercial division has a service area within a 70 mile radius of Raleigh, North Carolina. Including the Triangle Area, Raleigh, Durham, Garner, Apex, Cary, Fuquay Varina, Clayton, Chapel Hill, Willow Springs, Fayetteville, Pittsboro, Holly Springs, Wake Forest, Greensboro, Burlington, Goldsboro, Benson, Pinehurst, Rocky Mount, Wilson and Smithfield.